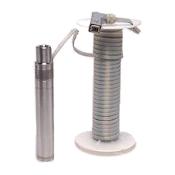 Grundfos RediFlo 2 Submersible Groundwater Pump | Enviro-Equipment, Inc. Stainless Ssteel & teflon components resistant to contamination. High flow rate capabilities, up to 9 GPM. Variable frequency drive controller allows for fine tune flow adjustments. Motor lead lengths of up to 300 feet. The Grundfos Redi-Flo 2 is a variable speed submersible ground-water pump used for pumping, purging, and sampling groundwater. It is crafted out of teflon and stainless steel - chemically inert materials that protect your sample from contaminents. It can achieve flow rates up to 9 gallons per minute. It is powered by the Redi-Flo Variable Frequency Drive, which allows the flow to be adjusted with an excellent degree of precision. The pump fits into a 2 inch diameter groundwater well. A cooling shroud can be purchased for well applications that are larger than 2 inches. The Grundfos Redi-Flo 2 has motor lead length options up to 300 feet. Available in 1 ft. increments from 30 to 300 ft.